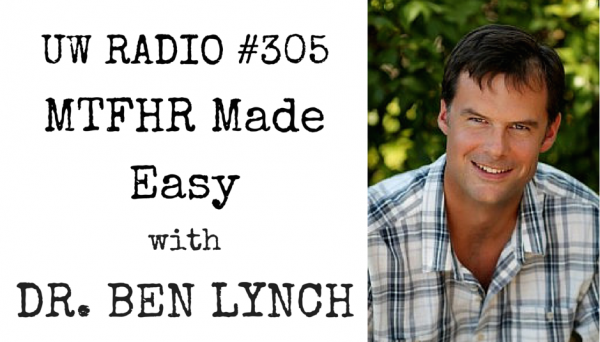 Podcast #305: MTHFR Made Easy! One of the most suggested guest EVER — Dr. Ben Lynch — made his first appearance on the podcast this week. And he crushed it! The big reason why he hadn’t been on the show before was the fact that I had no idea what MTHFR was. I had seen and heard it come up before, but never took the time to study it. The general consensus on the MTHFR topic is that it’s too complex for the lay person to understand. So I made it my personal mission to help Dr. Lynch break it down in a way that everyone could understand. I think we did a darn good job, too! 5:35 – Folate: the backbone of numerous key reactions in your body. 8:27 – A MTHFR football analogy to help you get it. 11:20 – You need THIS for activated folate. 12:51 – MTHFR gene mutation: who, what and why. 14:45 – How Dr. Lynch found out about his own MTHFR gene mutation. 15:42 – Hold up! A quick MTHFR review.